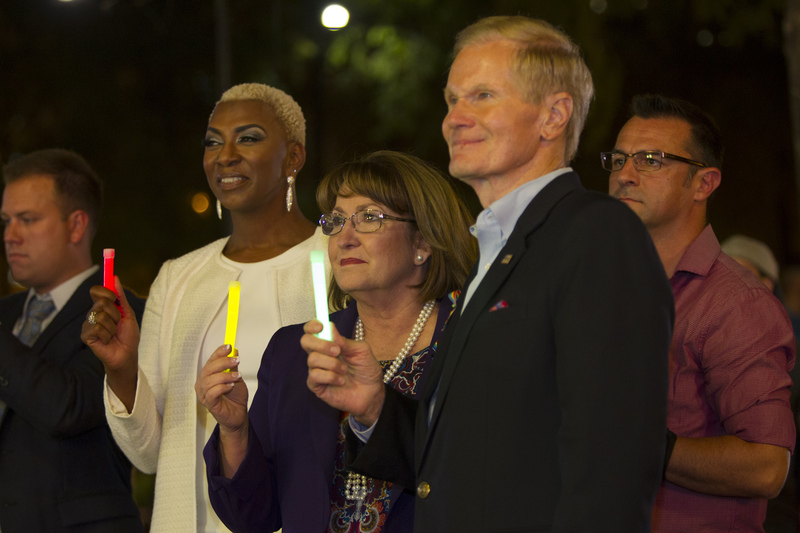 On Dec. 12, Orange County Government and the City of Orlando hosted a Pulse Six-Month Remembrance Ceremony to honor the 49 victims, their families and 68 wounded in the Pulse nightclub tragedy, which occurred June 12. Survivors and the family and friends of victims were joined by community leaders and elected officials at the gathering, held at twilight on the plaza surrounding Orange County’s Regional History Center. The ceremony featured remarks by Orange County Mayor Teresa Jacobs, City of Orlando Commissioner Patty Sheehan, Pulse nightclub owner Barbara Poma, Jennifer Foster and Carlos Carbonell from the LGBTQ Alliance as well as special performances by the Orlando Gay Chorus and acclaimed singer-songwriter Sisaundra Lewis from “The Voice.” GLBT Center Executive Director Terry DeCarlo emceed the ceremony. The event also featured the debut of a digital gallery featuring thousands of photos, including archival photos from the Orange County Regional History Center, numerous images by Orange County Government Photographer Frank Weber – on-scene for virtually all Pulse activities and events – and countless photos from citizens, Pulse victim families and friends, and others that capture the various memorials, vigils and ceremonies that occurred across the region in the days and weeks following the tragedy. The digital gallery is free and open to the public during the Orange County Regional History Center’s regular operating hours. As part of the One Orlando Collection Initiative, the History Center also presented the One Orlando Digital Memorial, which will serve as an online collection for all of the memorial items and events surrounding Pulse. The gallery will highlight images of individual items collected at the memorial sites and their current state in preservation, as well as the community artwork and international support that was received. Orange County Government and its Regional History Center established the One Orlando Collection Initiative in partnership with the City of Orlando and numerous community stakeholders and partners, including the Historical Society of Central Florida, in order to preserve history and properly care for the many thousands of tribute items created in response to the tragic loss of life that occurred at Pulse. The One Orlando Collection Initiative has been working collaboratively with all local, regional and impacted individuals, institutions and agencies toward the goal of expanding our shared understanding of these defining events and their continuing legacies. Since its inception, the Orange County Regional History Center has collected more than 5,000 items and has been the repository for the physical and digital memory of the Pulse nightclub tragedy.